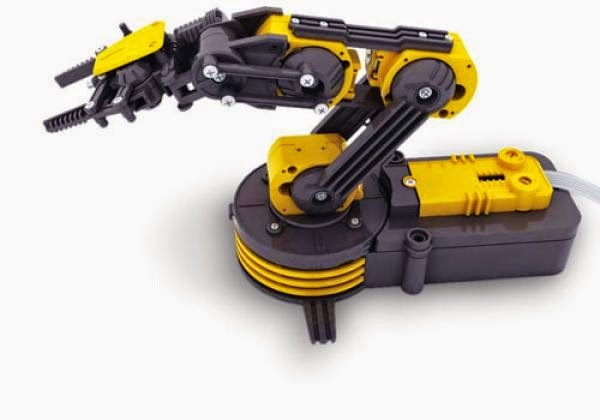 This Robot Arm Kit looks fantastic, is a great toy and a fun educational tool aswell. The build your own Robot Arm kit comes in a box of parts, where you must use your engineering, electronic and manufacturing skills to build a truly superb robot arm. Some products really capture your imagination and Build your own Robot Arm Kit is definitely one of them! The finished Robot Arm reminds us of the ones commonly found in automotive factories all across the world. This Robot Arm is a great gift for so many people and for so many reasons! The wired control robot arm kit comes disassembled so it's an ideal way to learn about basic robotic technology. If you know any budding engineer then this would be a perfect way to get them started. Build your Own Robot Arm kit has five motors, all controlled via the wired handset which allows you amazing, precession movements. It has a maximum lift weight of 100g, an opening gripper capable of grasping anything up to 1.7'' in width, a 120 degree wrist pivot, a 300 degree elbow motion, a 180 degree base motion and an LED search light for night-time operations.